The Neuschwanstein Castle was opened to the public seven weeks after the death of King Ludwig II of Bavaria, in 1886. It was also known as the `Fairy-tale King’. King Ludwig was a great admirer as well as supporter of Richard Wagner, a world renowned composer and the castle had been built in his honour with several rooms in the castle’s interior inspired by Wagner’s characters. The beautiful castle also served as an inspiration for the castle in `Sleeping Beauty’ which later on was adapted as a famous Disney castle towards the start of each film that was produced by that production house. Neuschwanstein, New swan stone, is one of the fairy tale castlesin the world which is perched on top of rocks above the ravines, 5 km east of Fussen and literally means `new swan cliff’. 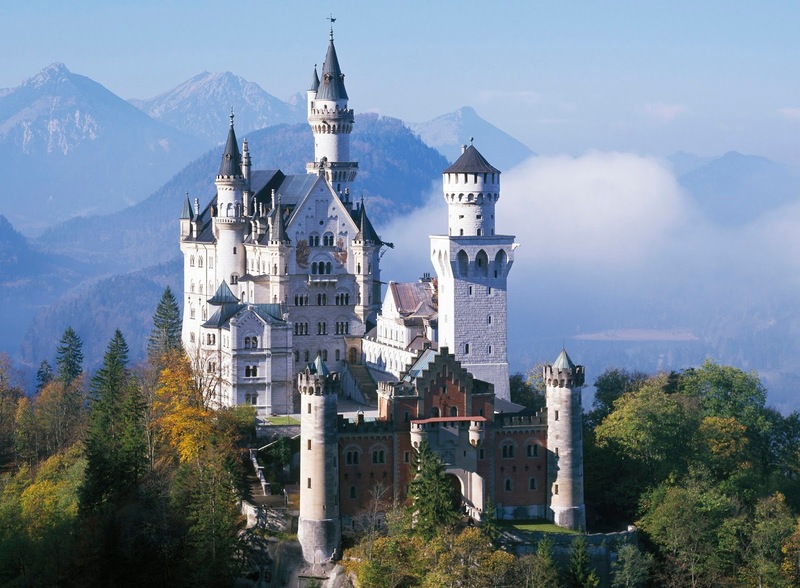 It is now one of the most visited castles in Germany and the most popular tourist destinations in Europe. Each year 1.4 million people come to explore the castle and in summer around 6,000 visitors a day walk through the rooms which were intended for a single inhabitant. The castle is situated in Bavaria in the proximity of the town of Fussen. Neuschwanstein actually means `New Swan Castle’ with reference to `the Swan Knight’, who was one of the Wagner’s characters and looks precisely like a fairy-tale castle built in the 19th century in Bavaria when castles had no defensive purposes. Though it appears like a medieval castle its interior has state of the art technology of that time. For instance on each floor of the castle there are toilets with automatic flushing system together with air heating system for the entire castle. Water supply is done from a nearby spring located at 200 meters above the castle. The castle’s positioning is also a fairy-tale one which is located in the Alps in Bavaria, Germany amidst a splendid landscape atop a hill and overlooks the Hohenchwangau valley. Tourists visiting the castle will find the landscape surrounding the castle extremely awesome. The town of Fussen which is near Neuschwanstein is also a popular tourist destination in Germany. In 1869, the construction of the Neuschwanstein castle began and was initially projected to last three year. However Ludwig II desired that the castle should be perfect and hence the huge building remained incomplete at the time of his death in1886. The castle had an amazing inner garden surrounded by a walled courtyard and also had an artificial cave. The palace comprised of guardhouse, chivalric house having a square tower and fortified castle with two towers on the west end. The entire configuration had theatrical effect from outside as well as inside and the interior were decorated with scenes from the operas of Wagner, chandeliers together with semi-precious stones and amazing sculptures. Its interior was as beautiful as its exterior and though only 14 rooms were completed prior to his sudden death, they were majestically decorated. The throne room of two storeys had been designed in Byzantine style having wall paintings, portraying angels and oddly there does not seem to be any throne in the Throne Room since Ludwig died before it got completed. Walt Disney was the source of inspiration to this fairy-tale look of Neuschwanstein castle in creating the Magic Kingdom and presently it is the most visited castle in Germany as well as one of the most popular tourist destinations in the world.